at heavy rain we visited the destination of the last but one stage of the lake constance classic motor rally. in the small town bad schussenried the 140 oldtimer arrived at noontide. contrary to the destination of the first stage in friedrichshafen on thursday where prime weather and physical distance had provoked a more impersonal feeling today we had the chance to smell the oil, fuel and interior. a scene that is more appealing to me. 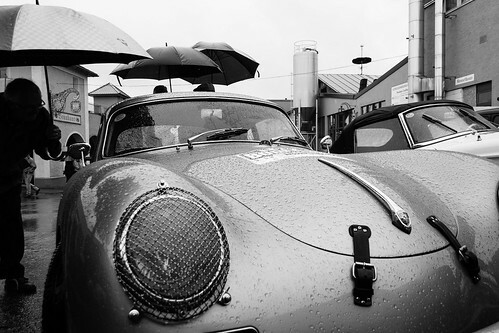 the spectators were really cute: many of them were wondering if the cars don't have issues with the rain... the pic above expresses this thought very well - it seems that the guys like to protect the wonderful porsche 356 a gt, 1957 model, against the rain.